Is it an outie or an innie? That's a question that might cross one's mind during a bout of self-absorbed naval gazing. But it's also a question that might come to mind when you're planning this year's Christmas light display. That's because some LED Christmas bulbs are generally more suited for outdoor use: The 5mm wide-angle conicals, for example, may be a bit bright for some indoor applications. And conversely, some bulbs are more suited for indoor use. But some bulb designs defy categorization as an outie or an innie. M5 LED Christmas lights are a perfect example. Used properly, M5 light sets perform with distinction for both outside applications and indoor applications. 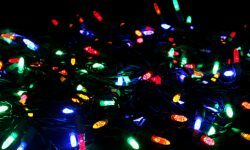 If you've been a Christmas enthusiast for a number of years, you're probably familiar with the incandescent mini-lights that have long been popular. M5 light sets have a lens that is virtually identical to those old but very popular stand-bys, while also offering a vibrant and smooth illumination. But while M5 sets offer the long-standing appeal of the old incandescent mini-lights, they also provide all the modern advantages of LED lighting. That means that they're brighter, longer lasting, and use only a fraction of the energy that incandescent minis require. When it comes to the actual sparkle of an incandescent light set, you’ll find that our other very popular set, the 5 mm Wide Angle Conical, offers the closest look to incandescent in regards to intensity. But if you are looking for a steady, multi-directional illumination with pure, smooth, evenly lit bulbs, then the M5 LED is your light set. The multi-angled surface of the faceted lens tends to spread the glow of the internal diode more evenly across the surface of the bulb. Something about the little M5s are quite intriguing. They seem to have the inexplicable allure of a campfire. They draw your attention. Just like the dancing flames of a fire, they're always different and yet always the same. Perhaps it's the delightful dance of the light beam choreographed by the faceted lens. Perhaps it's the enchanting peculiarity of the light wavelengths emitted from a M5-sized diode. Regardless, admiring the beauty of the M5s surely beats naval gazing!